CRISPR/Cas9 system is a bacterial defence mechanism against bacteriophage infection. When a viral dna(Bacteriophage, in this case) integrates into the bacterial genome, it produces RNA which is taken up by Cas9. Cas9 and the RNA together floats and drifts through the cell and as soon as they encounter a sequence complementary to the RNA, it gets attached to it. Cas9 chops off the dna from there. As the viral DNA is chopped off, it prevents the virus from multiplying. Thus the bacteria defends itself by precisely snipping out the viral DNA from its genome using CRISPR/Cas9 system. The recent implementation of CRISPR/Cas9 system in human beings, animals and bacteria for gene editing has led to a lot of interesting research in this area. It requires designing of sgRNA known as Single Guide RNA, which is a challenging process. To solve this problem, CRISPR-ERA was developed. 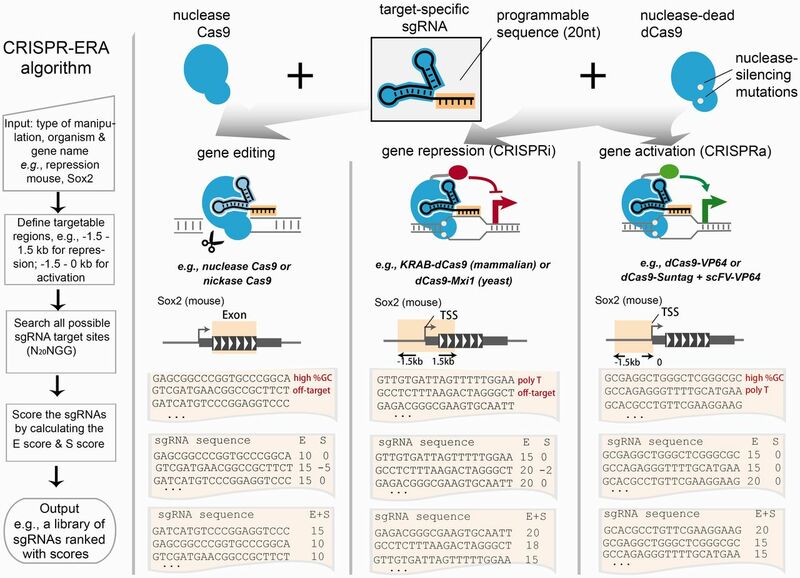 CRISPR-ERA is a new tool available at http://crispr-era.stanford.edu developed by Honglei Liu et al. It is an acronym for Clustered Regularly Interspaced Short Palindromic Repeat-mediated Editing, Repression, and Activation. The major goal of our designer tool is to address the discrepancy for designing sgRNAs that allow efficient and highly specific repression or activation of genes and for generating genome-wide sgRNA libraries for genetic screening in different organisms. CRISPR-ERA looks up all targetable sites for each target gene, for patterns of N20NGG (N = any nucleotide). It then calculates E and S score. The result it then presented according to the E and S score. Does Cas9 already present in our body or it is introduced externally? Hi Muniba, Thank you for your interest in knowing more about Cas9 protein. Cas9 is found naturally in Bacterial cells. It has evolved as a bacterial defence mechanism against bacteriophage.